What If C-SPAN Produced MTV’s Cribs? Since no man is tempted to every sin, I’ll take credit for having kept envy in check for the most part. 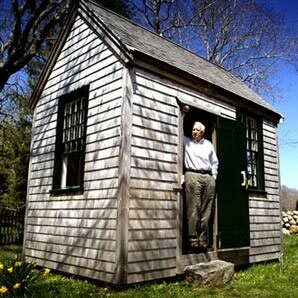 But after I saw the great David McCullough’s writing shed on his HBO documentary, Painting With Words–the Shed is discussed here [see Part 3 [of 4] @ 8:50]–I must admit that envy quickly caught up to my six other deadlies. What If C-SPAN’s Brian Lamb Produced MTV’s Cribs? DJ Whatever: I bet this shed seen a few [female dogs] yo … [guttural giggle]. DJ Whatever: Ya alright, be like that. I get it, it’s the cameras right. DJ Whatever: Hey man, I can’t work with this here Gramps, he gotta loosen up yo. 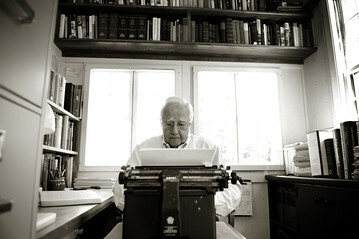 McCullough is not alone among writers finding confined spaces conducive to productivity. 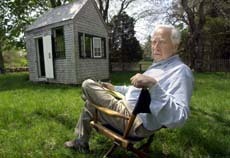 This entry was posted in Books & Reading and tagged Bibliophile, David McCullough, The Canterbury Tales. Bookmark the permalink.